Recorded at Paul McCartney's family home in early 1960, You'll Be Mine was a parody of US vocal group The Ink Spots. A doo-wop satire sung by McCartney, You'll Be Mine is unsophisticated teenage fun complete with falsetto harmonies, although Lennon's spoken word interlude does give an earlier indicator of the wordplay later used in his books In His Own Write and A Spaniard In The Works. You'll Be Mine was taped at 20 Forthlin Road, Liverpool, during a time when The Beatles were finding it hard to make headway as a group. 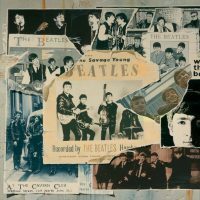 The recordings are the only ones known which feature Stuart Sutcliffe on bass guitar. Of the 16 songs known to have been recorded at the Forthlin Road rehearsal, just three were released on 1995's Anthology 1; the others were Cayenne and Hallelujah, I Love Her So. Hm, wonder who said that? Any way, this little diddle shows the grrreat crossmusicology (wordplay) of the Beatles, even at the age of four… – Or what was it again, at the time?? To me it sounds like “brought that toast” or “brought me that toast” not burnt. That’s what lyrics websites and Wikipedia seem to think as well. It’s tricky to tell. It sounds like he’s saying ‘brurnt’ – somewhere between the two. I don’t think there’s a ‘me’ in there though: on the bootleg version I have, which is at a slightly lower pitch and slower tempo than the Anthology version, there’s some tape distortion before the word ‘that’ (it temporarily cuts out). I presume they cleaned it up while preparing Anthology for release, smoothing over the distortion but leaving a bit more confusion too. Well, when I listened to it closely it sounds very much like “when you broke that toast” not burnt or brought.. Despite the atrocious recording, this is a remarkably musical parody, and a very good piece of vocals. I had to sit through several Inkspots (aka Stinkpots) records when I was young, and this captures the essence of them really well. Or rather “when YOU brought ME that toast” ? I think that’s Stuart speaking the middle section. No. That is very much John. But if the Lead is Paul, who is doing the falsetto? George is singing the falsetto part. paul is singing lead and John does the spoken part. I think the spoken passage is funny, it always sounded “when you brought me the post the other morning”, haha. Amazing how people can really get hung-up over the slightest, ambiguous little thing.